In your resume, you can demonstrate this understanding by including lots of specific details about your background and experiences that mirror the duties and knowledge of the open job. Using examples and templates can also help you create a stunning document that gets results. You can also take a look at top traditional resume templates to find even more ideas about how to format your career highlights and history and make an even greater impression. Why Use Traditional Resume Templates? In some cases, it makes sense to limit your resume to one-page or less. Most traditional resume templates follow the one-page format to help entry level jobseekers or those looking for a part-time position. 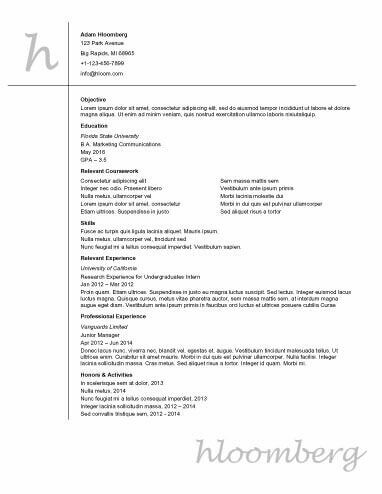 A one-page resume can also be perfect for nearly any type of industry or position because it keeps candidates from including too many unnecessary details. For some candidates, it may be necessary to go further than one page and provide a two-page resume to the hiring managers. These candidates typically have a few more years of experience beyond the entry-level stage. It may be a good idea to explore the different types of resume by industry to see if a two-page document would work for you. One of the most common resumes is the traditional professional style. Traditional resume templates are plentiful and easy to adapt to any type of industry or position. Some hiring managers want to see a more traditional style that contains all of the basics of your work history, education, skills, and important achievements. Start with some of these simple templates to bring your details to life. For an entry level candidate, it’s important to have a compelling resume that shows employers what you can do. Entry level jobseekers don’t have as many professional experiences, so they must prove to hiring managers that they have strong potential for success in the position. Looking at entry level examples of traditional resume templates can help you get started. Another challenge that some jobseekers face when making a resume is a situation where they are changing careers. A resume for a career changer may need a different type of format, such as a functional resume format, to make hiring managers see beyond the typical work experience for your new industry or position. Begin your resume with your basic contact information so hiring managers can get ahold of you. Use your full first and last name and avoid any unprofessional nicknames. Include a phone number as well, such as your cell phone or home number. Additionally, a professional email address, your website, your social media contacts, and your city and state of residence are standard to include in this section of your resume. Next, make sure your resume includes a professional summary statement or objective statement to help hiring managers get an overview of your top attributes. Summary statements give you a powerful introduction that shows why you’re great in your resume. If you’re an entry-level candidate or career changer, an objective statement can help you break the ice. You can give details about what you can offer to potential employers with a list of impressive skills. Depending on your industry and position, you may include approximately four to six skills in your list. Be as specific as possible and include required skills from the job posting to make your information more customized to each position. The longest section of your resume is typically the work experience section. Organize your details going back in reverse chronological order, starting with your current job. Include each position, the name of the company, and information about your accomplishments and responsibilities. Start each item of your list with an action word to make your experience come to life for the hiring manager reviewing it. Finally, it is customary to close your resume with your educational history. In the education section, include your highest level of education along with any relevant training or certification courses you have taken for the open position or industry. resume builder is the perfect place to start putting together a results-oriented document. You’ll learn how to customize your resume for your talents, industry, and job type. You can also create multiple versions of your resume to give each hiring manager an individualized document that is perfectly aligned with the job advertisement.